Having a bowl of porridge in the morning is a good way to start your day. Unlike other sugary cereals, porridge contains a wide range of vitamins and minerals; it is high in fibre, can help lower cholesterol, and is ideal for losing weight. Porridge is a versatile food that can also be used to brew beer, thicken soup or to make pancakes, amongst other things. 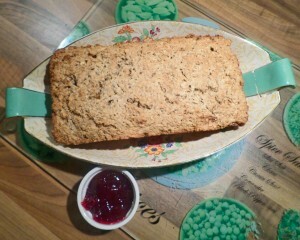 A new healthy recipe that my mother has started baking is porridge bread. It doesn’t have the most appealing name but it’s tasty and, more importantly, it’s healthy, unlike most breads, which are made of crushed wheat. Normal bread rapidly spikes blood sugar, which can stimulate overeating. Quite simply, porridge bread is one of the best breads you can eat, and it’s easy to bake. Try it out! Optional: handful of sesame seeds, sunflower seeds, poppy seeds. Place bread soda, oil and the yogurt in a mixing bowl. Using the same yogurt tub, measure two tubs of porridge oats and add to the bowl. Add your favourite seeds at this point. Stir thoroughly. Place in a greased, standard loaf tin (2lbs/900g – 18.5 x 11.5 x 9cm). Cook at 180°C (try a little higher for first attempt 200°C and then lower half way through). Cook for approx. 45 mins (depending on your oven). Ten minutes before the end of cooking time, remove the bread from the tin, turn upside down and cook for remaining 10 mins. Leave to cool on wire tray wrapped in a clean tea towel.